So you own a small business and chose Intuit QuickBooks software to help you run your business. Well, here at Armor Techs, we made the same decision and while it does a decent job, I have run into many issues with the software. 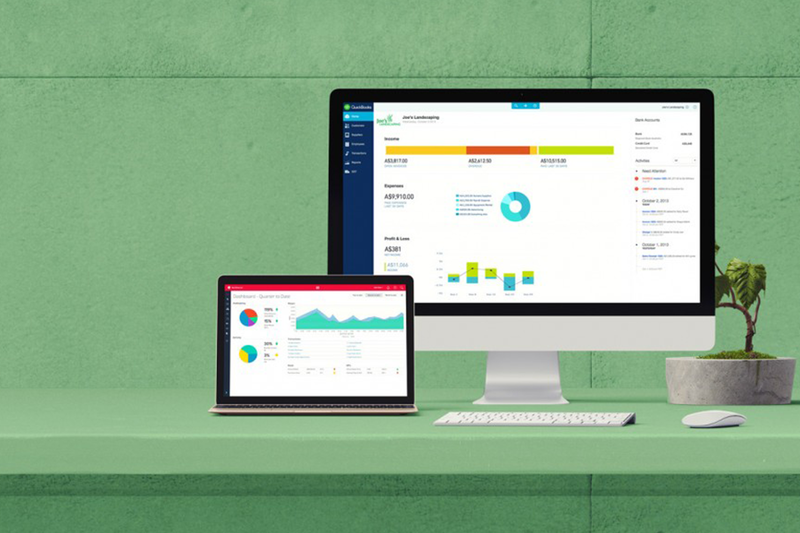 Currently, I am using Intuit QuickBooks Enterprise Solutions 18.0. This is the desktop version and not the online version. However, the process discussed today should work for most versions that are not online versions and assumes that you already know how to enter a bill and pay it. We’ll discuss what issues you may have when entering a refund you receive from a vendor in QuickBooks, how to enter refunds correctly, and give you a brief review of the software. 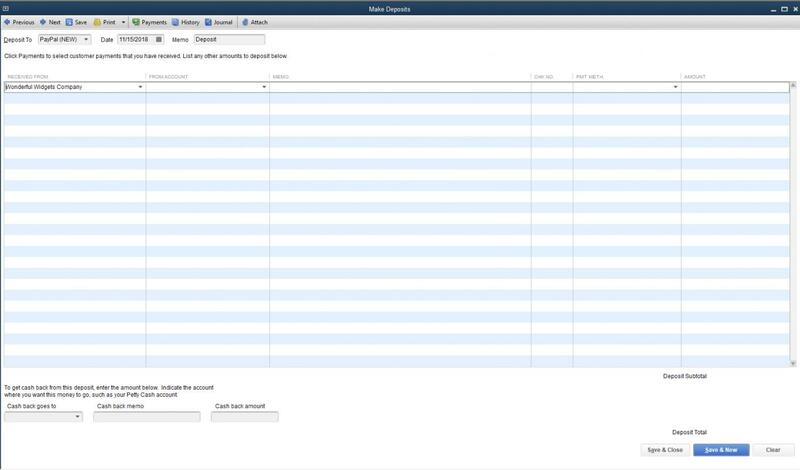 The deposit window can be used to record any funds received for deposit including refunds, but it doesn't include an item column for inventory and units on hand tracking purposes, and doesn't include a customer / job column for job costing purposes. Also, if you've previously entered a bill credit to account for the inventory, making an entry in the deposit window using the associated expense account will not be applied against the vendor account, leaving the credit on the account unapplied. Now that the problem has been defined, we will go through the two ways of properly entering in a refund from a vendor in QuickBooks. The first solution is for those of you who using the cash basis of accounting, don’t create and pay bills within the system, and don’t track inventory or do job costing. The second solution is for those of you who do create and pay bills within the system. It is also the solution you will use if you track your inventory and/or do job costing. On the home screen, select the Record Deposits Icon. In the Deposit To field, select the account in which you want the refund applied to. In the RECEIVED FROM column, select the vendor who issued the refund. In the FROM ACCOUNT column, select an account (usually an Expense or Cost of Goods Sold account). In the MEMO column, write in any notes that apply. In the AMOUNT column, enter the amount of the refund. Click Save & Close if you are done, or Save & New if you have another refund or deposit to make. 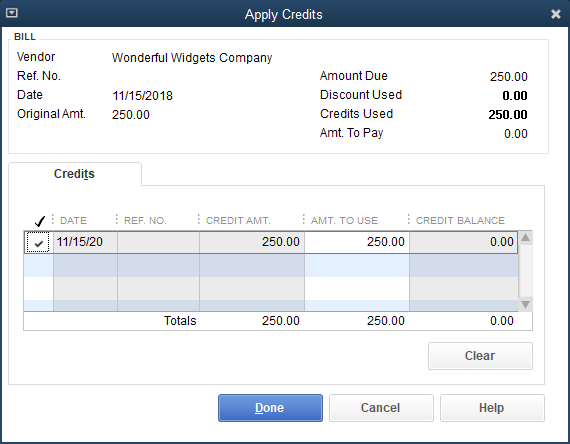 For this solution, we will look at a fictitious example of a bill created for the purchase of 100 blue widgets at a price of $5 each from Wonderful Widgets Company. Job costing is not the focus of this example, so the CUSTOMER JOB filed was not filled out. On the home screen, select the Enter Bills icon. 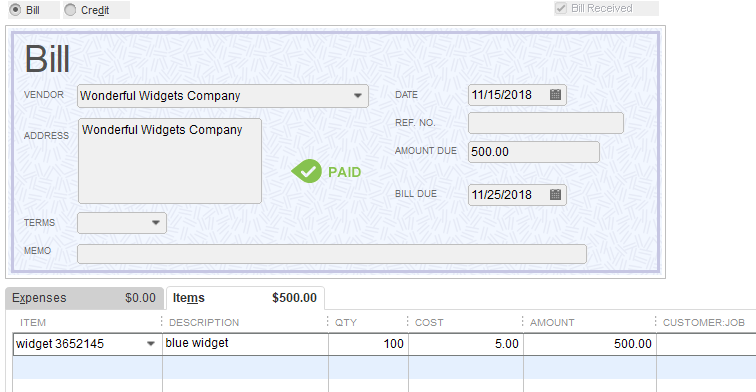 Select the Credit option and fill out the various fields in a way that mimics the original bill. There are 50 units entered in the QTY column, because that is the number of defective units that were returned at a price of $5 each, which gives us a $250 credit/refund. Press Save. Follow the Solution 1 instructions, but with one difference. In the FROM ACCOUNT column, select Accounts Payable. This is very important. On the home screen, select the Pay Bills icon. Now that we have entered both the credit and deposit, we will see the refund pop up here in the Pay Bills section. Check the box so we can move on to set the credits. Notice that we now have 1 credit that is worth $250. Select Set Credits. The credit is now set against the deposit from step 4. Click done. 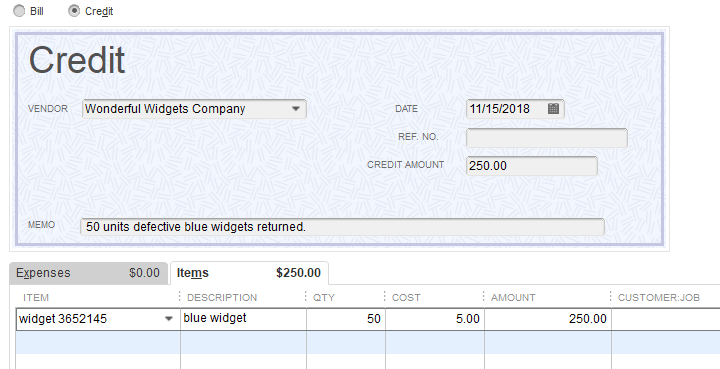 Note that the $250 in the AMT DUE column is now canceled out by the $250 in the CREDITS USED column giving us $0 balance in the AMT TO PAY column. Select Pay Selected Bills at the bottom right of the window. Check your work. At this point, we want to view our Vendor List and verify we have a $0 balance. If you are tracking your inventory, then you will want to view your Items List to make sure the amount of widgets we returned is reflected in our total. In this case we ordered 100 widgets and returned 50. Notice that our amount total shows 50 widgets in stock. This means that we have successfully recorded a refund from a vendor. QuickBooks gets the job done. However, I would like to see them streamline a few processes to make it more user friendly. If you are tracking your inventory or job costing, then it would be better to not have so many hoops to jump through to enter a refund. It can be very confusing and a significant waste of time, as you can see from the solutions above. If you have any questions in regards to this or any other issue, there are a couple options you can choose from. Contact us here at Armor Techs, and we will assist you. If you have found this blog post helpful, please like and share it with your fiends.